Yesterday, we celebrated Daddy's birthday and I invited my friends to came over on our house last Saturday for a small celebration to gave thanks for another life of my hubby's life. I made the cake as my birthday presents for Daddy.The icing is made of Swiss meringue buttercream and the ghost is molded with white and black chocolate. Well, check my post as I reveal why am so busy and what level I am at cake decorating course.Although, the ghost is not perfectly molded but I am happy with the result since my friends told me, my cake and icing is yummy. Ang taray! Ibang level ang inggit ko sa mga marunong mag-bake, hehe! Ganda ng cake, parang ansarap nun chocolate ghost! It's beautiful. I want to try cake decoration too especially fondant. but I need to practice baking first. I tried several times but there is always something wrong with the outcome. hehe... I need to practice. 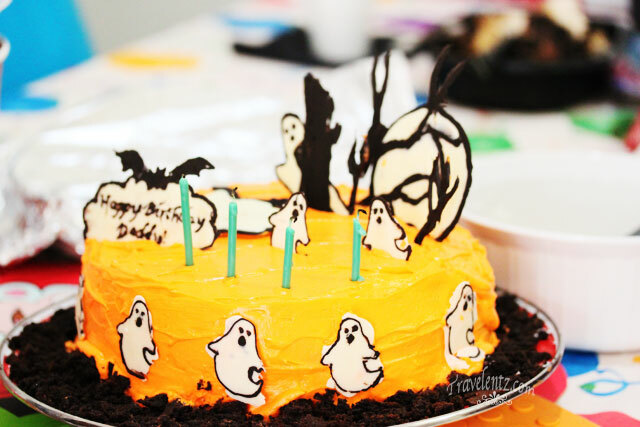 What a spookily cute cake that's great for Halloween parties! wow! very creative cake. Where's Casper? The cake looks yummy based on the picture and the description. Kudos to you! how cool! that is one really cute cake. Spooky! That would be perfect and fun to eat this Halloween!